Introduction: This Grade 6 Earth Science Weathering and Erosion Unit focuses on weathering and erosion and addresses the California Science Standards for 6th grade for the topic of reshaping the topography of the Earth and Investigation and Experimentation Standards. Changes in the Earth are caused by weathering of rock and soil, and by transportation and deposition of sediments. By the end of the unit students will know that water running downhill is the dominant process in shaping California’s landscape. Rivers and streams are dynamic systems that erode, transport sediment, change course and flood their banks in natural recurring patterns. Rivers flow to beaches where sand supplied by the river is moved along the coast in predictable patterns by the action of waves. In addition, a significant California landslide or slump is representative of water logged soil sliding downhill in the local La Conchita area. The Grade 6 Earth Science Unit on Weathering and Erosion is presented to students through a series of investigations using indirect evidence (models) and direct evidence, experiments, active learning experiences, researching using a variety of sources, questions, and assessments. Assessments include: pre-, post and two formative assessments. Conceptual Flow Narrative: The Grade 6 Conceptual Flow Narrative for Earth Science: Weathering and Erosion builds on the concepts presented on the conceptual flow graphic by describing the concept(s) addressed in each lesson and the links that connect each lesson to the next. Lessons are linked to the previous lesson and the lesson that follows via a conceptual storyline enabling the development of student understanding as they progress from one concept to the next. After students have completed the Pre-Assessment, they begin their exploration of weathering and erosion with Lesson 1, “Mechanical and Chemical Weathering”. Mechanical refers to forces such as wind, water, or ice that break rocks into smaller and smaller pieces. Changes are physical and change only the size of the rocks. Chemical weathering refers to interactions between the rock material, water, and air (oxygen and carbon dioxide) causing chemical changes of specific minerals. Chemical weathering changes the rock permanently and loosens rock layers. Formative Assessment #1 Weathering of Earth Materials assesses concepts about mechanical or chemical weathering. The assessment information is used to design interventions for future lessons. During the previous lesson, students learned that rock is weathered and changed physically or chemically. Lesson 2 “Wind Erosion” continues the exploration by modeling how the wind erodes and moves material to another location. The lesson begins with images of the “Dust Bowl” and continues with explorations of wind erosion in a combination of videos and wind / sand models. The next lesson continues exploring erosion and deposition of Earth materials by ice. Lesson 3, “Glacial Erosion,” links to the previous lesson by providing another example of how Earth materials are moved. Pictures of glacial changes are used to engage students in exploring a model of how glaciers scrape materials and form new landforms. The model uses ice cream and other edible items that simulate glacial movement. Glacial erosion is linked to the next lesson by exploring how water erodes and deposits material in new location. 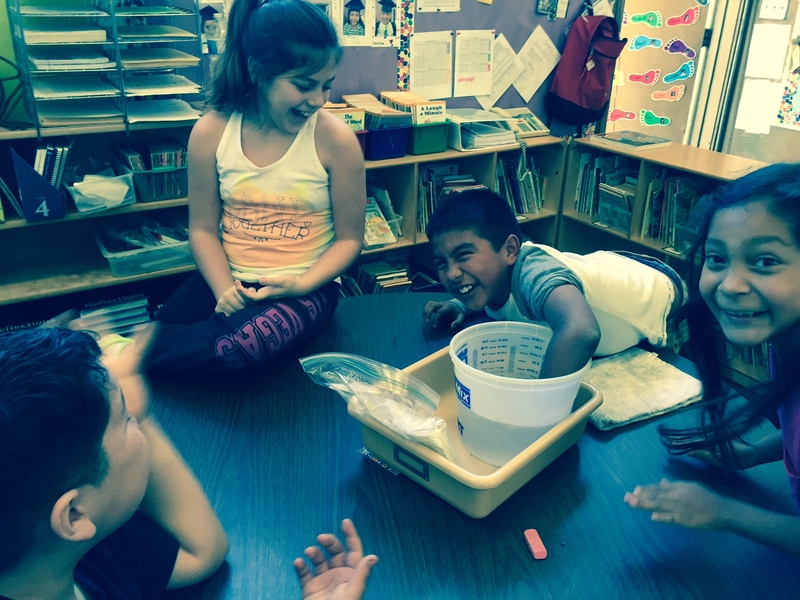 Having learned that forces of wind and ice can erode materials in the two previous lesson, students in Lesson 4 “Get Eroded” learn that water running downhill is the primary source that changes topography in California. Relationships between the independent variable (height of the slope) and the dependent variable (erosion of material) is explored through experimental design. Erosion by water from the previous lesson is linked to Lesson 5 “Local Landslides: La Conchita”. This example is a landslide or slump of a local hillside. Historical pictures and a model of how waterlogged soil can slide huge areas of soil are used to explore how slumps are formed and move. In the next lesson, students learn the deposition patterns of Earth materials in water. Formative Assessment #2: “Erosion Performance Task” is a authentic assessment used to measure student understanding of the relationship between the steepness of the slope and the type of materials eroded when water runs down the slope. The assessment could be used in place of Lesson 4 “Get Eroded” or to deepen understanding developed in lesson 4. Water moving downhill in the two previous lessons deposit sediments in predictable patterns modeled in Lesson 6 “Let’s Settle It”. Earth materials placed in a jar with water are tumbled and allowed to settle to the bottom of the jar. The sediments layer in predictable patterns that occur where water slows down in the natural setting. Natural locations for sediments include curves of rivers and mouths of rivers (ocean). In the next lesson, students learn that beaches are dynamic systems that continue to move the sand. While lesson 6 established how sand reaches the ocean, Lesson 7, “Beaches on the Move” explores how waves move the sand in a “River of Sand” along the edge of the beach. Summer and winter waves change the pattern of sand movement along the beaches. Man-made harbors and other structures alter the pattern of sand movement. Santa Barbara Harbor is an example of a man-made structure that changes sand movement and requires sand dredging to keep the harbor open. Lessons 1-7 are linked to three local field studies providing examples of changes in the local topography. Each of the sequenced hikes include pre-field trip experiences, planned stops of interest, and post-field trip activities. In Lesson 8a: Hike #1 “Hot Springs Trail”, students learn first hand to observe weathering and erosion on the Hot Springs Trail in Montecito, California. In particular, they will see evidence of erosion and weathering on hillsides, a seasonal creek, and rocks. During Lesson 8b: Hike #2 “Rocky Nook Park” students will see evidence of a debris flow and movement of sediments in by water flowing downhill in Mission Creek. On the next hike, Arroyo Burro, students will see where the creek empties into the ocean. In Lesson 8c: Hike #3 “Arroyo Burro Beach” students see evidence of where the creek empties into the ocean and examples of weathering and erosion caused by the ocean. Upon completion of the seven lessons and three field studies, students take a Post-Assessment to determine their overall understanding of the concepts presented in the unit. All links are now fixed! First of all, thanks so much for such great resources. I attended the CSTA conference in Palm Springs and have loved applying all my new ideas to my classes. I am hoping to download the complete 6th grade weathering and erosion unit to share with my 6th grade teachers but the link isn’t working. Is that entire unit available somewhere else online? I was reading through the 6th grade lesson on Weathering and Erosion. The lesson refers to a PowerPoint presentation. However, I am unable to locate the link for the PowerPoint. Is this not accessible? There are 7 powerpoint files, which one do you need? Thank you so much. This site and materials amazingly great stuff.